This Meatzza is adapted from none other than a true Queen of the Kitchen – Nigella Lawson, from her book Nigellissima. 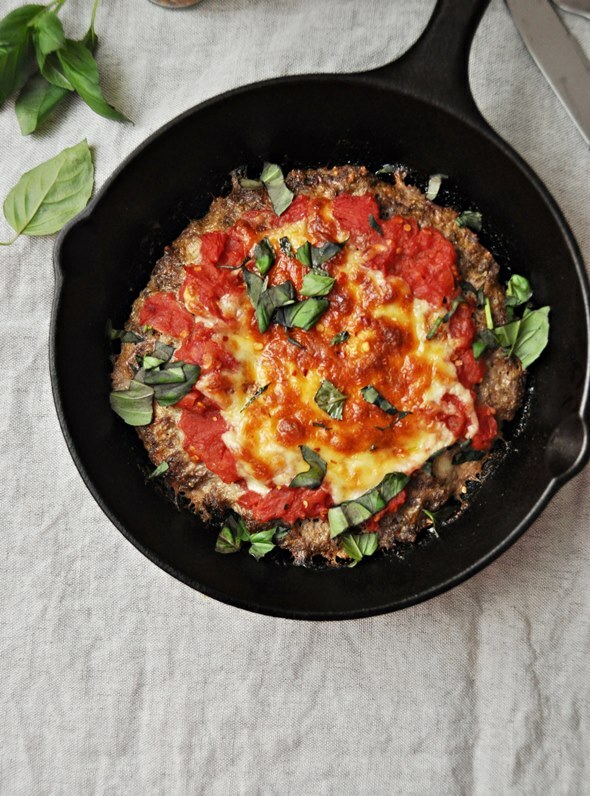 A Meatzza is the ultimate meat lovers pizza, or basically a giant rissole topped with tomato sauce and mozzarella. Which ever way you look at it, it’s still delicious! And, the way I see it is if the domestic goddess that is Nigella Lawson says that it’s okay to eat a meatzza. Then you follow, without any question. 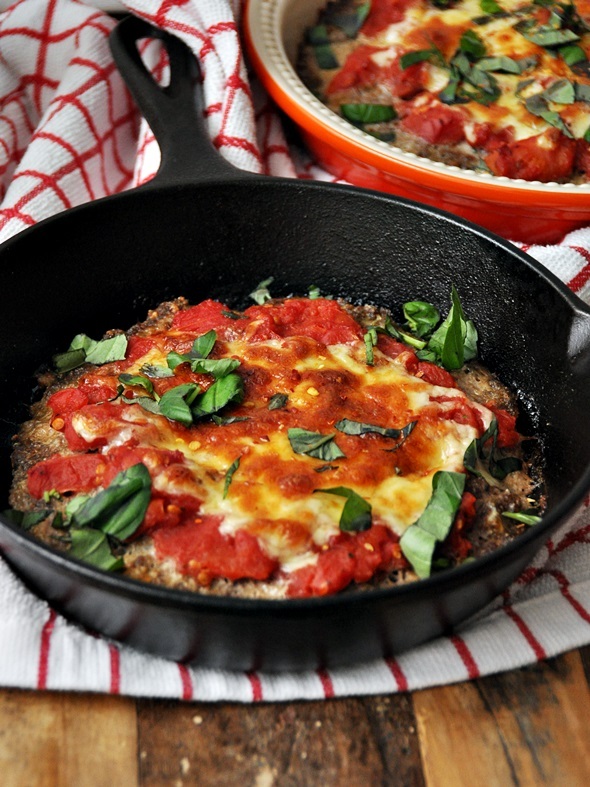 With so many people on strict wheat-free or gluten-free diets these days, this recipe allows them to still enjoy the glorious world of pizza by creating a meat pizza base. Yes read that right – A PIZZA BASE MADE OF MEAT! While the recipe does call for some breadcrumbs, there is the option of replacing the breadcrumbs with porridge oats, which very well it works, too. All in all, it’s just about perfect. In a large bowl, using your hands, combine the mince, parmesan, breadcrumbs or oats, parsley, eggs, garlic, herbs and add some freshly cracked sea salt and black pepper. Do not overwork it, just lightly mix together, or the meat will become compacted and dense. Spray a shallow, round baking tin of about 28cm diameter with the spray oil and push the meat into it, pressing the mixture lightly with your fingers to cover the bottom as if the seasoned minced meat were your pizza crust. Drain as much runny liquid as possible from your can of chopped tomatoes, then mix the tomato with the oil, herbs and some salt and pepper and using a rubber spatula, pread lightly on top of the meat base. Arrange the mozzarella slices on top, and then put in the oven for 15 minutes, by which time the meat should be cooked through and lightly set and the mozzarella melted. Remove from the oven and let it sit for 5 minutes, top with fresh basil leaves and bring it to the table before cutting into wedges, like a pizza. I love the colours of this dish. and is that cast iron? they always give a very “authentic” feel to the cooking. Awe thank you. It’s so bright and vibrant – it makes me want to eat it! Yes it is cast iron, I completely agree. Another bonus is it’s wonderful to cook with and it lasts FOREVER!